Main interest: Wintering and passage waders & wildfowl. Typical species: Little Egret, Wigeon, Black-tailed Godwit, other waders. Scarcer species & rarities: Leach's Petrel, Spoonbill, Great White Egret, Green-winged Teal, Gadwall, Scaup, Avocet, Little Stint, Curlew Sandpiper, Baird's Sandpiper, Spotted Redshank, Ring-billed Gull, Pied Flycatcher. Best bird: Caspian Gull (Feb 2007), Spotted Sandpiper (Nov 1982). 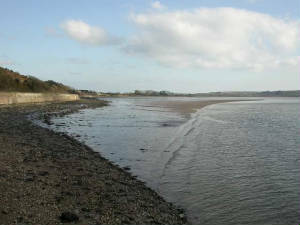 Access: Kinsalebeg lies just a short distance south-east of Youghal Bridge. From Dungarvan take the main Cork road west through the Drum Hills and on through Grange. Almost 6 km west of Grange village, take a left turn at the cross roads signposted for Clashmore and Cappoquin. At the next cross roads take a right turn which leads down to Ferry Point pier. The stony shoreline on the north side of the road near Ferry Point can be walked without difficulty and the mudflats/roosts further north can be examined. Many of the birds roost or feed in the narrow inlet off the main mudflat, although access to this area is difficult. To reach Ballynatray, turn right just beyond Youghal Bridge on the Cork side; this road skirts the west side of the Blackwater to Ballynatray. From Ballynatray, the road north leads through heavily wooded areas to Cappoquin, all totally under-watched and well worth exploring. There are, however, many small roads and it is quite easy to get lost. 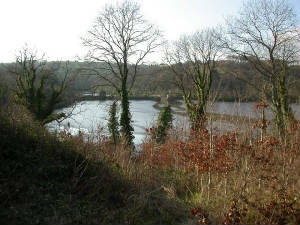 The Blackwater river is typical of many Munster rivers in that for most of its length it runs along an west-east axis through a Carboniferous limestone valley, draining much of Kerry, Cork and Waterford, before turning abruptly southwards and discharging to the sea through an Old Red Sandstone fold on the Cork-Waterford border. The soluble nature of the limestone till, east of Fermoy and in particular between Ballyduff and Lismore, has resulted in a low-lying river plain, the Blackwater Callows, which, when flooded in winter attracts internationally numbers of Black-tailed Godwits and many dabbling duck. 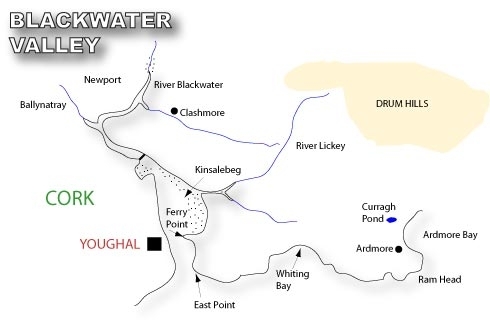 There are well-developed birch and oak woodlands in the tributary valleys of the Blackwater around Lismore and south of Cappoquin, on both sides of the estuary, with their associated plant and animal communities. Near the mouth of the estuary, the mudflats at Ballynatray and Kinsalebeg support locally important concentrations of wintering shorebirds. The Blackwater Valley from Ferry Point to Ballyduff is one of the most ecologically important areas in Waterford and is, without doubt, part of the hidden Ireland, with a multitude of birding opportunities. The Blackwater estuary includes coastline in counties Waterford and Cork, and good views of waders and other species can be had on the Cork side from the coastline north of Youghal town. Waterford sections of the estuary are covered here. Kinsalebeg is a an area of mudflats, including a small muddy inlet, on the east side of Youghal Bay which is used as a high-tide roost and feeding area by many of the birds that winter in and around the bay. Most of the species present at Kinsalebeg can be seen with little effort and at reasonable viewing distances, either from the main road on the Waterford side of Youghal Bridge or, preferably, from Ferry Point. In addition to the main species, there may be small wintering numbers of Gadwall, Pintail, Shoveler, Scaup, Goldeneye, Knot and Sanderling. Scarcer waders seen at Kinsalebeg including Little Stint, Ruff and Curlew Sandpiper in the autumn, with odd records of Spotted Redshank and Green Sandpiper even in winter, and a Baird’s Sandpiper, a first for the county, was seen here in September 1982. A Ring-billed Gull in January 1985 was also a first county record. Kinsalebeg receives relatively little coverage and it is likely that other rarities go unrecorded. By contrast to Kinsalebeg, the mudflats and the numbers of birds using them at Ballynatray are very small but the surroundings are idyllic, set in extensive woodlands with the tidal Blackwater nearby, and very close views of the birds can be had from the road. There is also the ruin of St. Molana Abbey, dating from the 6th century, formerly on an island but now surrounded on one side by a marsh (good for Water Rails) and on the other side by the estuary with exposed mudflats at low tide. Redshank are widely distributed over the mudflats, but other birds are less numerous. In winter, Herons, Curlew, Shelduck, Oystercatcher, Turnstone and Black-tailed Godwit are usually present with the odd Greenshank and, at times, Common and Green Sandpiper. A Spotted Sandpiper, Waterford’s first, was recorded here in November 1982. Newport, north-west of Ballynatray, is also worth a visit, offering extensive views of the Blackwater with many wading species from late summer on and the possibility of Fallow Deer at the water’s edge in the late evening at any time of year. Further north beyond the Bride bridge, the road passes close to the river allowing good views of the estuary, north and south, and the woods at Dromana. Large numbers of Teal may be present, Red-breasted Merganser are likely, and Green-winged Teal has occurred on these upper stretches of the estuary. Also keep an eye out for Otter here.